A child is the light of a family. In our case, its our infant. Yes, its our seven month old daughter who lights up our lives every time she smiles or makes a sound. However, the "chandni" of our lives has become a source of worry more than joy.. She is not well since two days. Our daughter is March born and this year in Delhi it was quite cold at the time of her birth. But at that time my antibodies i.e her mother's antibodies were protecting her from infections. This is the first time that she has fallen sick and we are dead scared. When a baby is born, all hopes lie on her. And when a baby falls sick, the whole world seems gloomy. 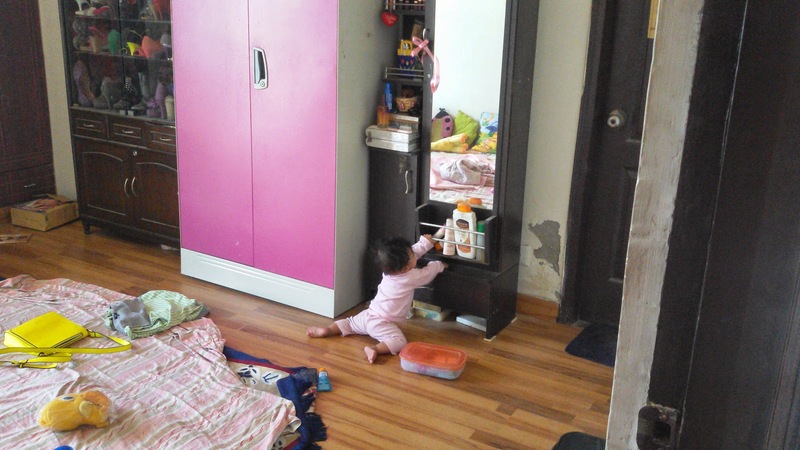 My daughter has just started crawling and its really difficult to confine her to a limited space. The weather here in Delhi has cooled down considerably and its quite cold at night as well as in the morning. The floors are really frozen and no amount of carpeting can prevent the chill from seeping up. Maybe this is the reason why our crawler has caught cold. When I was a child, my mother used to feed me Dabur Chyawanprash everyday in the morning. She used to say that it helps to fight infections by increasing immunity. I never complained because Dabur Chyawanprash tasted really good. Later on as I grew up, I came to know how it increases immunity. A concoction of Ayurvedic herbs like Indian Gooseberry ( Amla) and many others make it powerful. Now that I am a doctor I really get the science behind it. All the ingredients in it have powerful antioxidant properties. They strengthen the body's defense mechanism by stimulating natural killer cells which fights infections. I have patients whose babies fall sick every now and then. I advice such parents to incorporate chyawanprash and honey in their daily diet ( both Ayurvedic secrets to longer life) apart from taking medicines. My daughter being so small, I thought of starting this regime after she completed her first birthday. But since she has fallen prey to cough and cold with this season, I plan to start it immediately. Seeing your child sick is the most excruciating experience for a parent. Maybe I would get used to it later, I am hell worried right now. Our daughter is very, very naughty and seeing her sitting quietly at one place is beyond our acceptance. She does not have the energy to romp around the house on her four limbs ( she is a very fast crawler) the way she does grabbing and pulling and chewing everything that comes in her way. She is giving me real trouble while spoon feeding. Poor thing she can express herself only through crying and inactivity. We the parents on the other hand are shedding silent tears whenever she is coughing, sneezing or blowing her nose. I am just praying to God to cure her as soon as possible. I am taking every precaution possible.. covered her head to toe in warm clothes, carpeted our entire house, giving her milk mixed with honey. I plan to start Dabur chyawanprash very soon. Here is a timeline of our happy family. After all a healthy child makes a healthy home!! 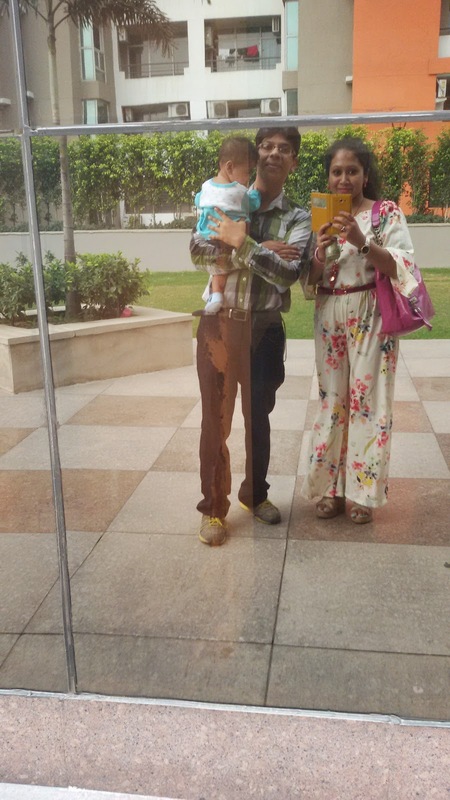 A family selfie on the glass walls of a building!! 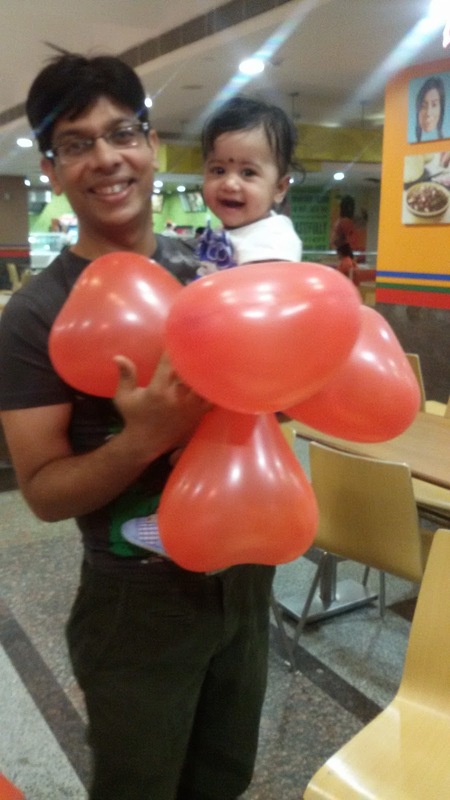 This naughty girl has learnt to play with balloons!! she is always found exploring her mother's dresser! Just after she was born..This moment is absolutely priceless!! I really hope she gets better soon, sweety!